The controversy still swirls around the method known variously as rollkur or LDR (low, deep, and round). Someone from a Facebook group I’m part of recently posted photos and video from Falsterbro, a high level competition in Sweden. This evidence showed that the method has truly become mainstream, with not a single rider working in any other fashion. Now that the Olympics are under way, there is further debate over the riders who clearly and openly practice this method – not the least of which is Adelinde Cornelissen who retired in the middle of her Grand Prix ride in Rio. Many of us have been railing against this method, and the damage that it causes – books and videos by the likes of veterinarian and horseman Gerd Heuschmann have been dedicated to the topic – yet it not only has persisted, but it has grown. The only hope we have is continuing education, and making a lot of noise. In that vein, I offer the following. First is Isabell Werth and Gigolo. This was one of the first pairs to openly practice rollkur/LDR in Dressage. She and her team mate, Nicole Uphoff (seen in the background in this video) were at the top of the rankings at this time (Isabell is also currently leading the Olympics, going into the individual medal round). Here she is warming up Gigolo using the rollkur/LDR method. Pay attention to the position of the rider, especially the arms and hands. Also, pay attention to the horse’s mouth, the fluidity of movement, and more importantly how the riding makes you feel. For contrast, now watch Reiner Klimke warm up Biotop at the same venue. Pay attention to the same factors of rider position and horse posture that you evaluated in the previous video. So, there are many points of biomechanics, technique, quality of movement, and much more that could be debated here – but I just have one simple question. Which of these rides would you rather experience? If you could be put in the place of either rider, to ride just as seen in the two videos, what would be your choice? The thing is, all arguments aside, the one clear point to me is that rollkur/LDR makes the whole experience look very unpleasant. Riders never look like they are enjoying themselves – and don’t get me started on how the horses look! The greatest talents in any pursuit, sport or art, make everything look effortless. Klimke’s ride looks almost easy – like anyone could just jump on and float around the ring. Werth’s ride looks like a lot of hard work for both her and the horse. I don’t work that hard on a green horse; after years of training, why would I want to be working that hard at Grand Prix? For more on the history of rollkur and LDR, how we got from a few riders in 1995 to a full arena of riders in 2016, I strongly urge you to read this recent post by Writing of Riding. She also offers at least one way we can make our voices heard against this practice. I have watched as many have tried to fight this trend in Dressage for years – and now I see more of it taking over at lower levels. It is a fight that horses are losing. It is a fight that those of us who treasure what Dressage is supposed to be are also losing. But I fear, from what I’ve seen, it is a fight that will only be won when outside forces get involved – I can only hope that those forces do not lead to the end of all riding. Be good to your horses … and speak out for all the others! 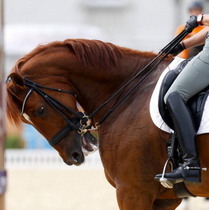 This entry was posted in Improving Your "Eye" and tagged Adelinde Cornelissen, Biotop, competitive Dressage, Dr. Gerd Heuschmann, Dr. Reiner Klimke, Dressage, Gigolo, Grand Prix, Isabell Werth, LDR, Olympics, rollkur, training, Writing of Riding. Bookmark the permalink.